Even deeper discounts than last time on top Reserve line from Jos A Bank. Last month these were Front Page at $159, now they are $58.20 and $118.90 and up. These are canvassed/half-canvassed chest suits, made in USA from Italian fabrics. These Reserve suits are real deal and in totally different league that suits you see in deals here from Macy's and similar stores. Their MSRP is around $1,100 - 1,350 and Jos A Banks often has them on sale for $600-800. On deep sales they drop to $300, you rarely see them discounted to $119!!! Reserve suits are on deep sale today, there are couple at $58.20, few for $119 and some for $238, with free shipping! Jos. A. Bank takes up to 60% off as part of its Easter Day Sale. (Prices are as marked.) Plus, Bank Account Rewards members bag free shipping. (Not a member? It's free to join.) Deal ends April 21. Jos. A. Bank takes up to 70% off most items sitewide during its latest sale. Also, get an extra 40% off clearance apparel and accessories. (All prices are as marked.) Plus, Bank Account Rewards members get free shipping. (Not a member? It's free to join.) Deal ends April 16. Jos A Bank has Select Men's Polo Shirts for $10. Shipping is free for Members( Free to Join), or free shipping on $50+. Jos A Bank has Soft Jackets Clearance for $20. Shipping is free on $50+. Jos A Bank has Flash Sale starting from 4/2 at 9pm CST and runs through 4/3 at 8:30am. Shipping is free on $50+ or for Reward members. Jos. A. Bank takes up to 60% off sale items. (Prices are as marked.) Plus, Bank Account Rewards members bag free shipping. (Not a member? It's free to join.) Deal ends March 31. Jos. A. Bank takes up to 70% off sale items during its Super Tuesday Sale. (Prices are as marked.) Plus, Bank Account Rewards members bag free shipping. (Not a member? It's free to join.) Deal ends March 26. At Jos. A. Bank, buy one select men's item and get a second one of equal or lesser value for free. Plus, select items in the Traveler collection are discounted. Even better, Bank Account Rewards members get free shipping. (Not a member? It's free to join.) Some restrictions may apply. Deal ends March 24. Jos A Bank has 100% Cashmere Scarf (Various Styles) for $16.99 (orig. $130). Shipping is free for Members, Free to Join. 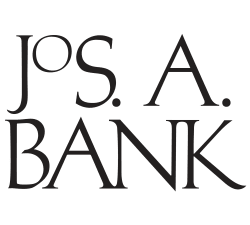 Deep discount on top Reserve line from Jos A Bank. Their MSRP is around $1,100 and Jos A Banks often has them on sale for $600-800. On deep sales they drop to $300, you rarely see them discounted to $80!!! Reserve suits are on deep sale today, there are few for $79 and bunch for $159, with free shipping! Jos A Bank has Reserve Collection suits on sale. Shipping is free for Rewards Members (free to Join). On a different note, ordered it 42R size yesterday and received it today. Though this one is of very good quality but too big and loose for me going to return it. Joseph Collection Slim Fit Suit Separate Jacket for $27 down from $358. Online only, Jos. A. Bank discounts select men's styles, including Traveler Men's Performance Pants for $49 and Traveler Men's Washable Wool Pants for $89. Plus, Bank Account Rewards members get free shipping. (Not a member? It's free to join.) Deal ends March 12.